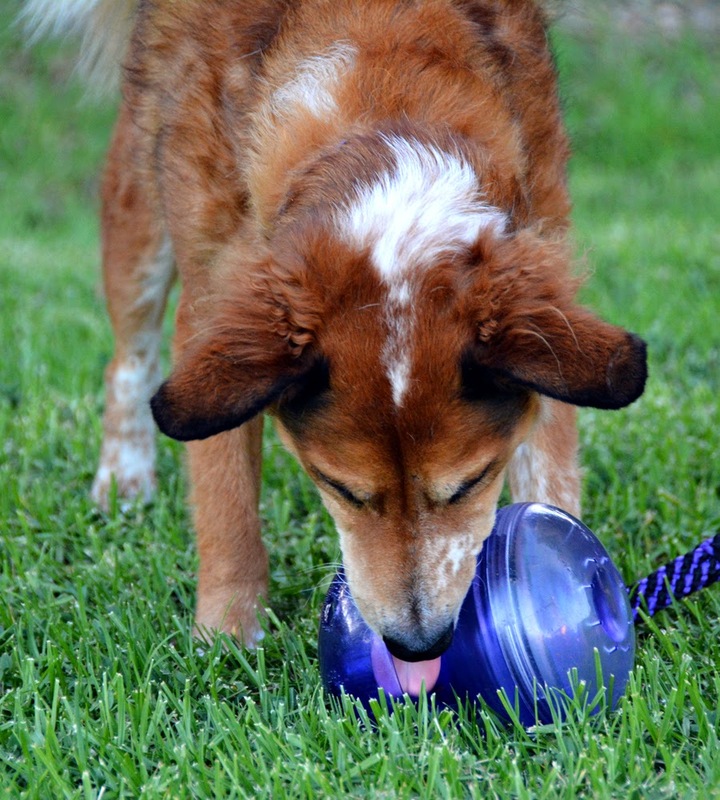 A lot of dog food companies like to advise their customers to stick with a single food for the life of their pet. 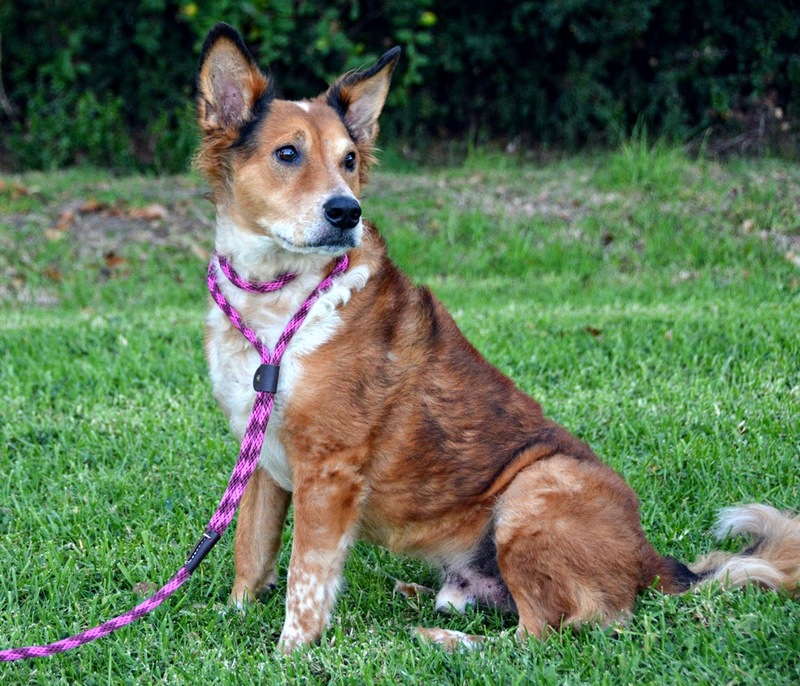 Some recommend switching flavors or formulas based on the dog's age, weight, and activity level. Some actually have multiple flavors to rotate through to prevent allergies or just plain boredom. 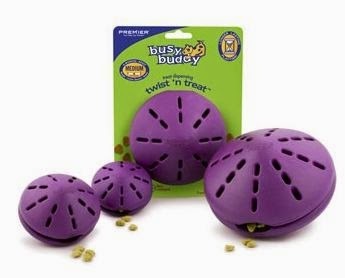 Still, the message is the same, "feed your dog this, and only/mostly this". 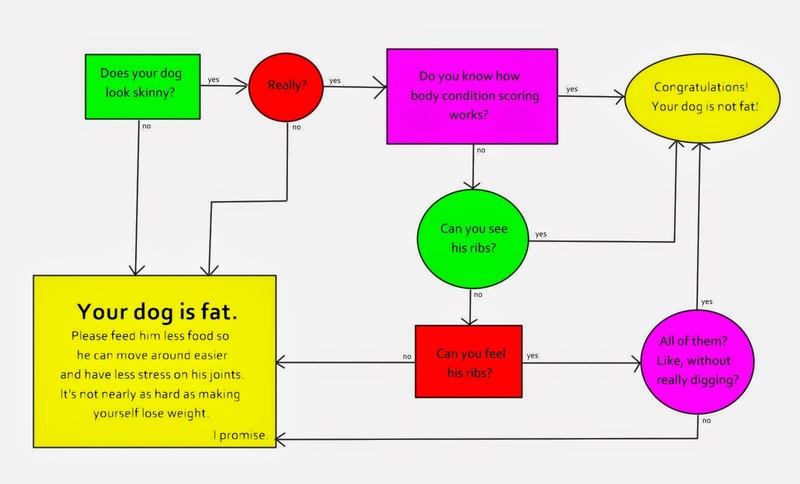 I know that people have been studying dog nutrition for longer than almost any other animal, so by now we have a pretty good idea of what our dogs need. On the other hand, I've also fed a variety of pets, from tiny parrots to absurdly large amphibians, animals that haven't been routinely kept in captivity long enough for us to even have a good idea of their expected lifespan. I have discussed, both online and in person, the care and feeding of amphibians, reptiles, rodents, and birds with some amazingly knowledgeable people, and have found that everyone agrees that a varied diet is essential. The attitude is that we don't know what we don't know, so it's best to offer a variety of foods to avoid gaps in the diet of any pet. It's not enough to just feed the packaged, preserved food sold by the pet store, no matter how much the company insists that this is a complete and balanced diet that meets all the nutritional needs of my hamster/gecko/finch/tortoise/rat/parrotlet/newt. How can I apply that attitude to feeding my dogs? 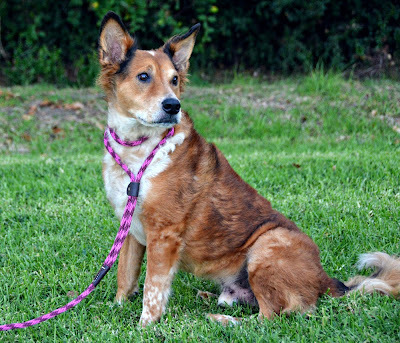 I've fed raw and homemade diets in the past, and Brisbane was exclusively raw fed until he was five or six years old, but I've gotten past my "Kibble is Evil!" phase and now I feed everything. Dry dog food is the most convenient everyday staple, but I also do some raw food, homemade cooked food, canned food of all sorts. 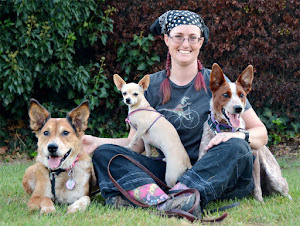 I also feed my dogs a variety of treats, supplements, and table foods. It's not that I don't trust the dog food companies to make a quality product, I just feel like hedging my bets. Maybe they put everything my dogs need in there, and maybe they missed something. Maybe my dogs don't have identical nutritional needs, maybe Brisbane processes red meat a little better than fish. 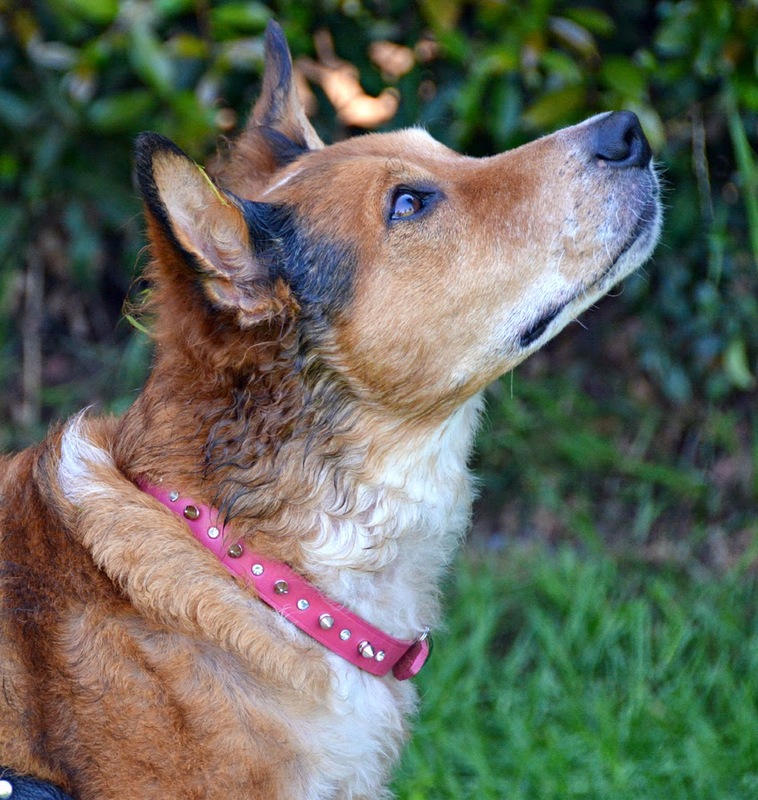 As long as my dogs can tolerate a variety of foods, I think the best way to assure myself that they are getting everything they need while avoiding nutritional gaps and the perils of pet foods of all sorts is to feed them lots of different foods. There aren't a ton of foods that Brisbane can eat, but I try to buy a different brand or flavor each time. I primarily feed Acana, Orijen, and Taste of the Wild, but I'll try anything Brisbane can eat. Ru and Ulysses also get the occasional egg or poultry product. I think it keeps things interesting for everyone, and I feel better knowing that any given problem with quality, taste, freshness, or contamination will only last as long as the bag. 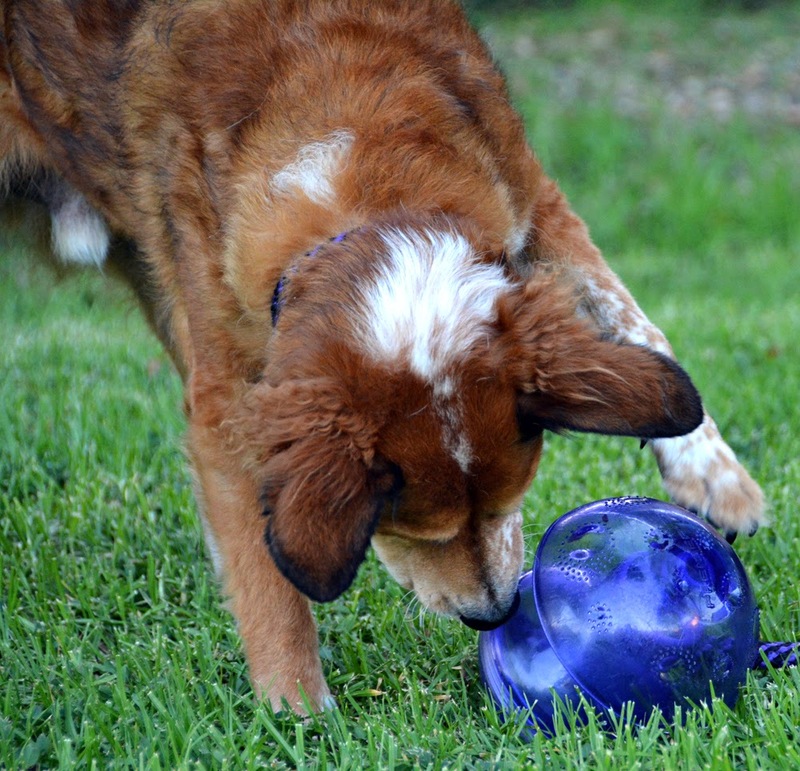 My dogs' diet doesn't just rotate, it goes exploring. I hate banana-flavored candy with the passion of several Christs, and immediately felt bad for my dogs when I looked at this picture and realized I had fed them banana-flavored treats. It's ok though, because the Twistix Yoghurt Banana Dental Chews are actually made with real bananas instead of the artificial banana-flavor that haunts my dreams. I'm not crazy about real bananas and I'm not supposed to eat them either, fortunately my dogs quite enjoy them and are willing to handle any and all banana emergencies that may arise. 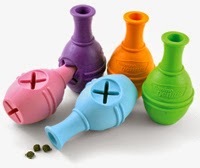 These arrived in our March BarkBox, had I picked them out myself I would have gone with Vanilla Mint or Pumpkin Spice or literally anything other than banana. Good For: Occupying Brisbane and Ulysses for about ten minutes and making them smell slightly minty. 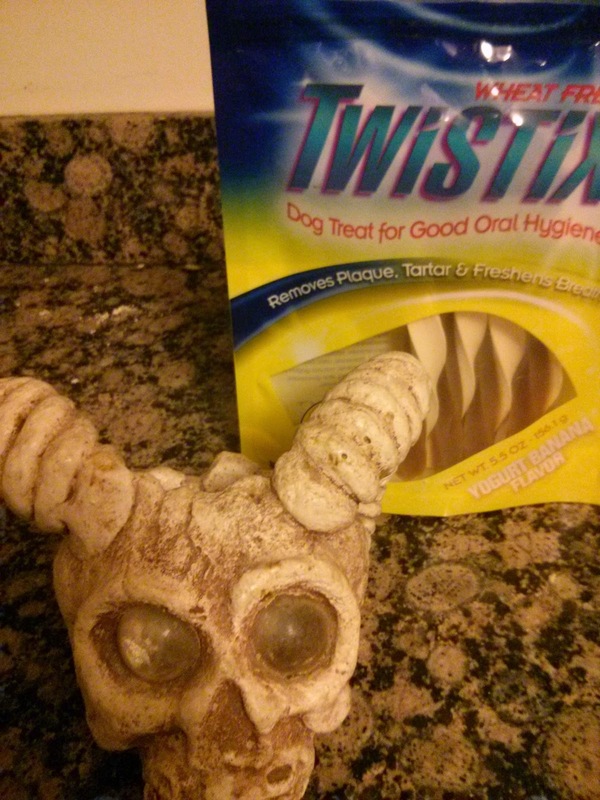 Not Good For: Lasting longer than a similarly-sized bully stick, actually cleaning teeth. 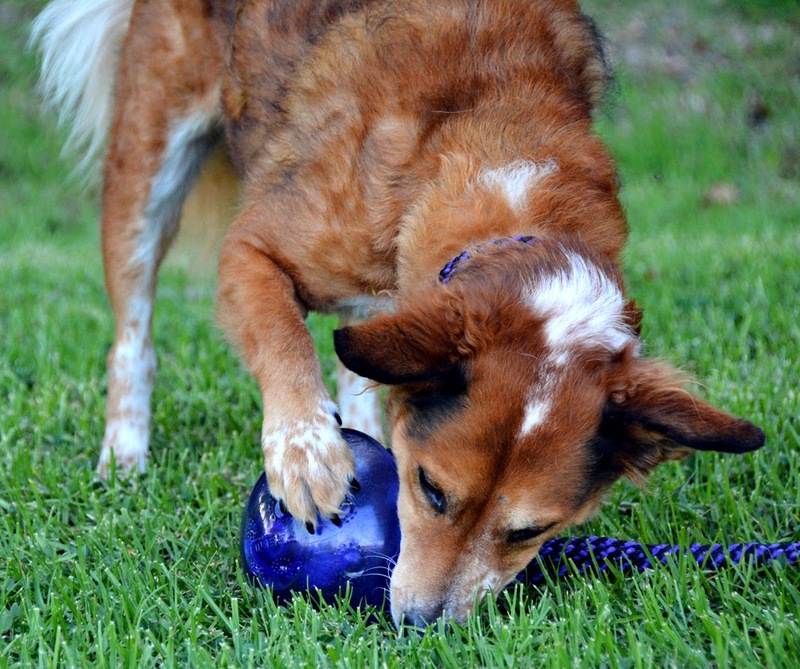 How Much We Like Them: Enough to chew them until they're all the way gone, unlike rawhides and yak chews. I just ordered a bag of Vanilla Mint ones. My husband also just reminded me that I routinely toss my banana, coconut, and bubblegum-flavored Jelly Bellies to Brisbane, so I guess I shouldn't feel bad about feeding them banana treats. I'm just mildly perturbed that banana-food managed to sneak into my house under false pretenses. The Lone Wolf Slip Lead is a simple slip lead made from a wide, soft synthetic braid. It is available in 4' and 6' lengths in a multitude of colors and combinations. Ours is a 5/8" wide 4' purple/black slip lead. 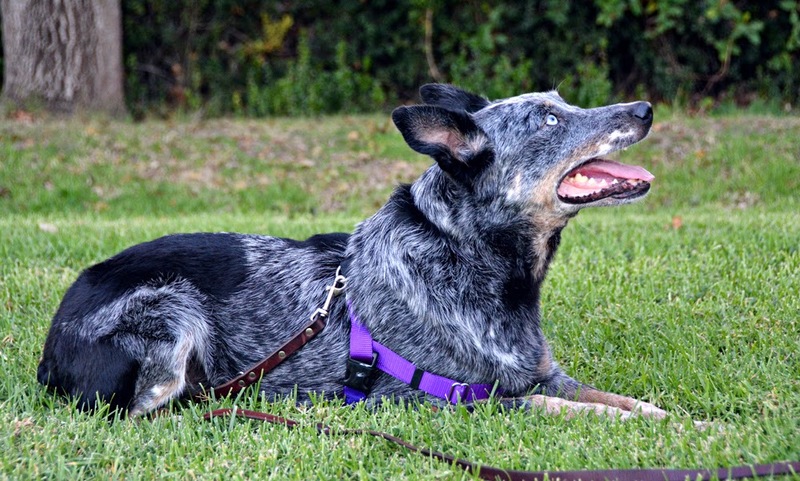 I love Lone Wolf's soft, wide slip leads, we have a matching 4' martingale lead that is Brisbane's primary leash. I don't normally use full slip leads for my dogs, but I do keep them around. I bought this one specifically to use at work. The wide flat braid material is nice and grippy when my hands hurt. I find it easier hold than Mendota's round braid leashes, and less rope burny than Timberwolf's slip leashes. Pros: Comfortable and easy to hold. 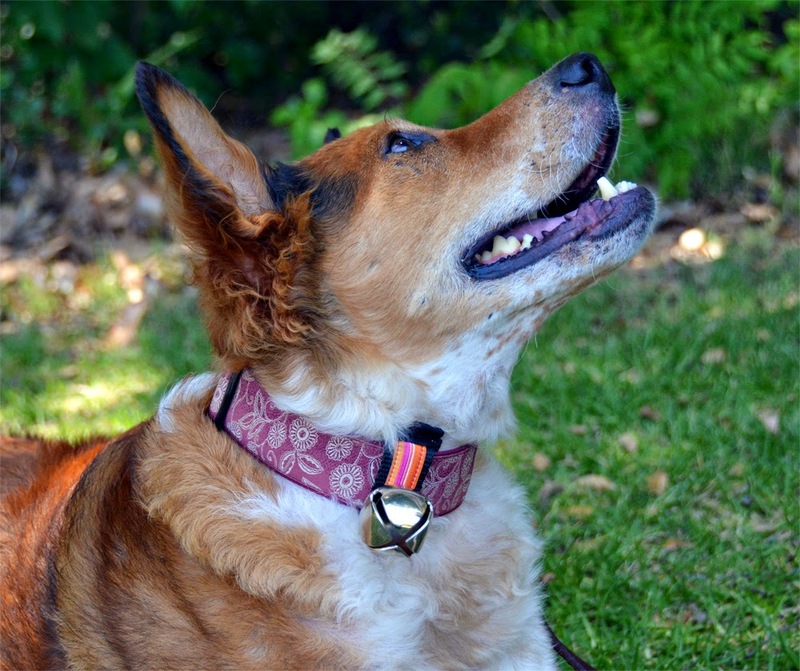 Ring slides freely and leather stop prevents leash from opening wide enough to allow escape. 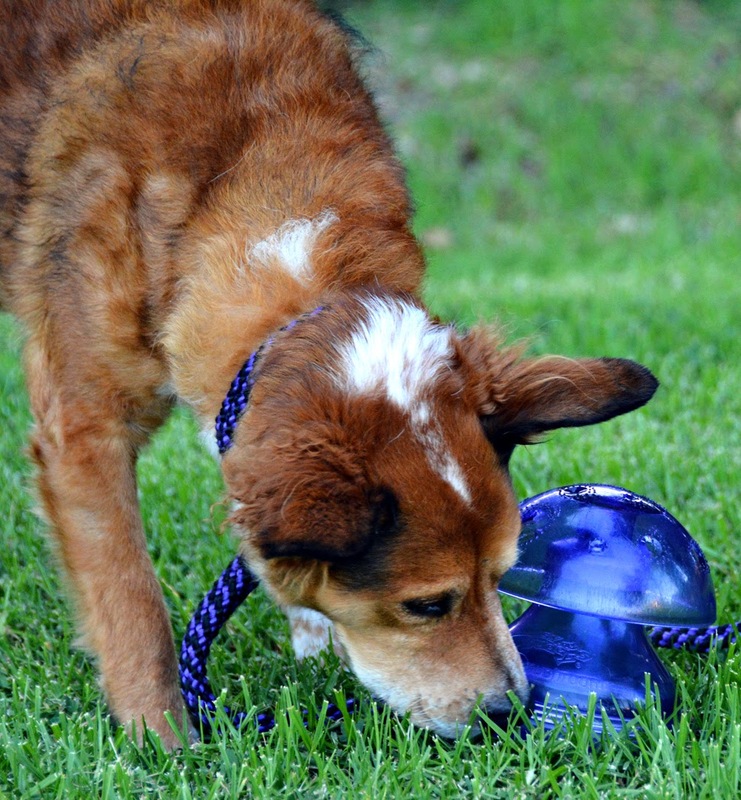 Wide webbing distributes pressure comfortably both on the dog's neck and on my hands. My favorite slip lead for days when my hands are sore. Cons: Strands of the braided strap can get caught on things and pull little loops loose. Bottom Line: Loved my martingale lead so much I got a slip lead just like it. The November Allergy-Friendly BarkBox finally arrived, and it is, of course, Thanksgiving-themed. Everything in it is pretty cool, and I'm a little curious what the normal Bark Boxers got. 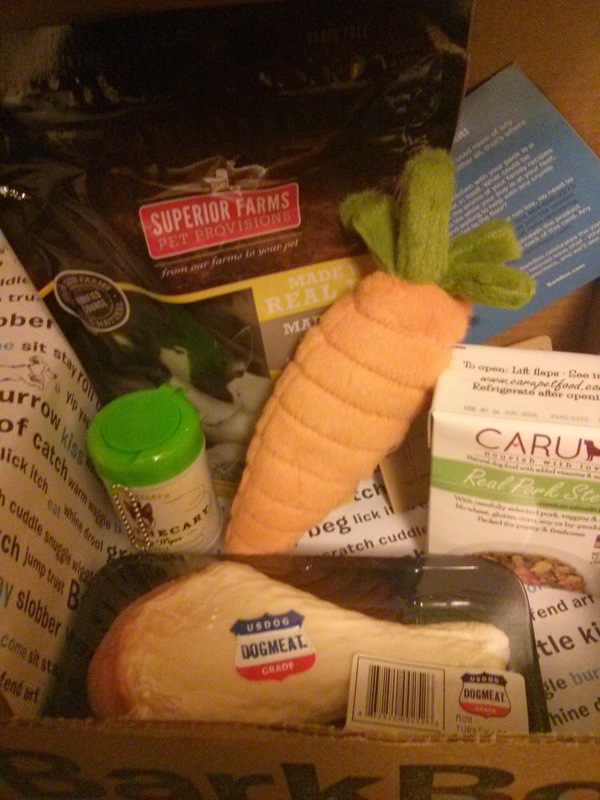 The Caru Real Pork Stew is the most unexpected thing in this month's box. I've never encountered their products before. It is delightfully Brisbane-safe with no poultry or egg ingredients. Caru also makes other flavors of stew, including turkey. I bet everyone else got turkey stew. Did you guys get turkey stew? Don't worry, that's not a real raw chicken leg, it's just a squeaky toy from PetProjekt, packaged to look like raw poultry. It is so delightful I don't even want to take it out of the packaging yet. I need to leave it in a few more unexpected places to weird people out before I actually give it to the dogs. PetProjekt also makes some phenomenally realistic sea shell squeakies, and I have been coveting a nautilus for some time. 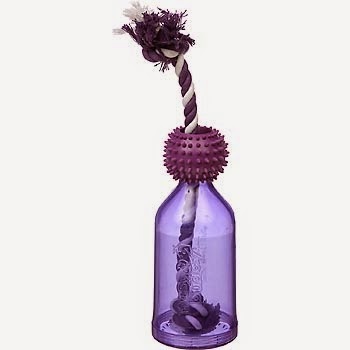 Yes, I covet dog toys. I buy them based largely on what they will look like strewn across my floor. It's like interior decorating for lazy slobs. We got a squeaky carrot from P.L.A.Y. that is adorable and will probably go over at least as well as our crab and squid. I finally bought a squid. I will do a review on it eventually. Is that a bag of lamb biscuits from Superior Farms back there? Why yes it is! While I'm delighted, this is another one that I'd like to compare notes on to see what the non-allergic pups got. The last thing in this month's box is a little keychain container of SafeMade Apawthecary Cleaning Wipes for touching up yucky dogs. We don't get anything resembling snow around here so we don't have to worry about salt on delicate feetsies, but these could up being useful anyway. The Canine Hardware Travel Bed is a compressible, packable dog bed that unfolds into a floofy cushion. It has a slick fabric on the bottom that repels dirt, hair, and those stickers that always get stuck in your socks while camping. The other side is soft and flannel-like. The travel bed comes with a matching stuff sack to keep it clean and mooshed down into a space-efficient package. I love this travel bed largely because it looks like a sleeping bag. It is also had a bit more padding than the Ruffwear Bachelor Pad bed, though it doesn't pack as small. 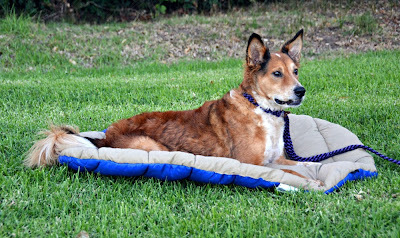 It is also a lot bulkier and provides a lot more cushioning than Ruffwear's Highlands bed, which is a similar style to the Canine Hardware Travel Bed. 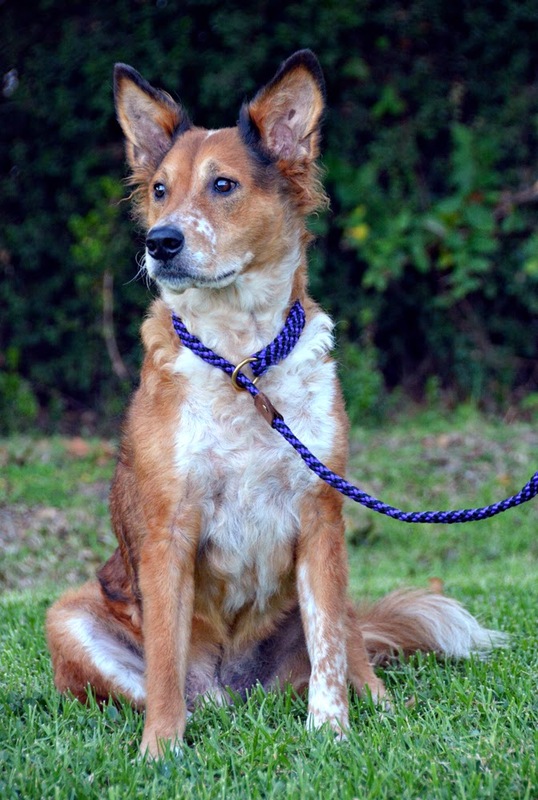 Over the last few months, Brisbane has developed some arthritis in his hips. He now has a prescription pain medication, and it is important that he have soft, warm places to rest. 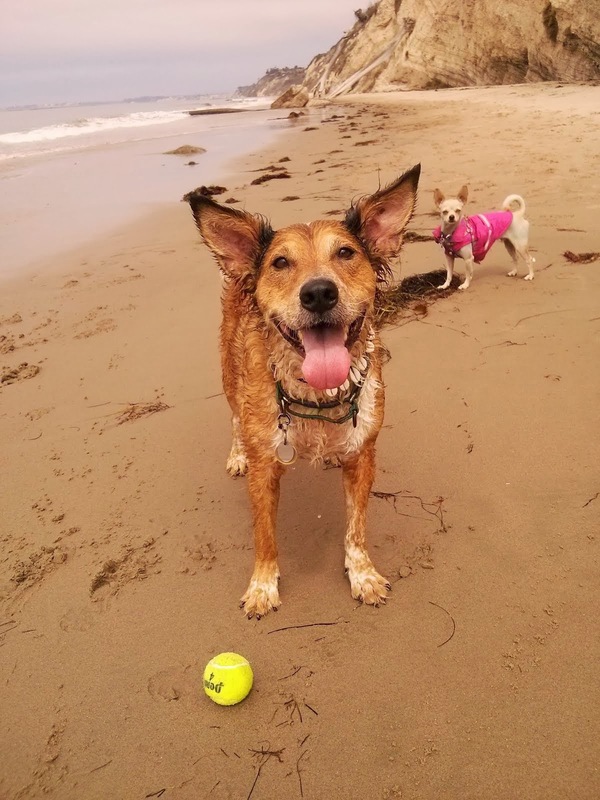 Briz is a house dog on the beach in Central California, so he doesn't have to deal with anything approaching freezing temperatures. Still, I like having this bed for exercises like the Protocol for Relaxation. 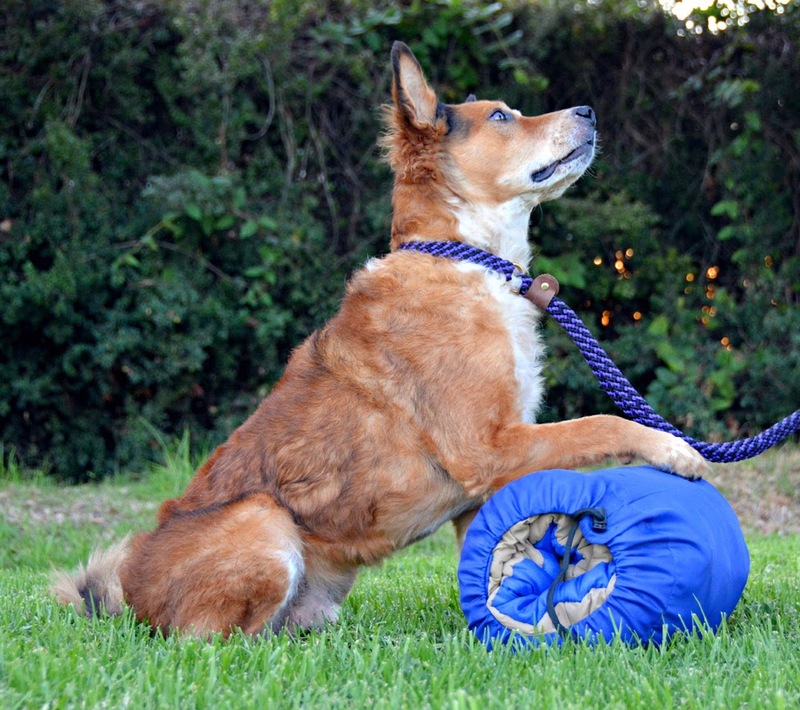 The Canine Hardware Travel Bed is not an orthopedic bed, it isn't very supportive and has little padding compared to a regular pillow bed. Still, it's pretty comfy for something that packed down a little smaller than a regular sleeping bag. Pros: More portable than a regular dog bed, more comfortable than a blanket or a towel on the ground. 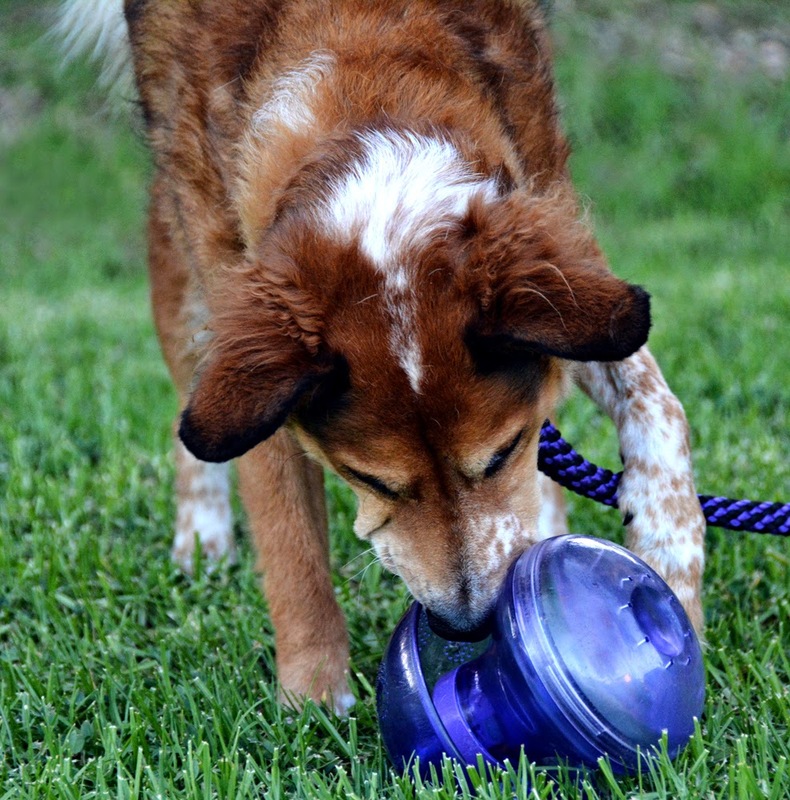 Makes cafe visits and outdoor classes a little nicer for spoiled, spoiled dogs. Machine washable. Doesn't pick up ground crud like regular bedding. Cons: Kind of thin. Packs slightly smaller than a regular adult sleeping bag, which makes ultralight backpackers cry. Bottom Line: Awesome for camping and going places, convenient to keep in the car. This bed will be going with us on camping trips, but probably not backpacking. The Kyjen Doggy Blocks Spinner is a hard plastic board game puzzle toy. 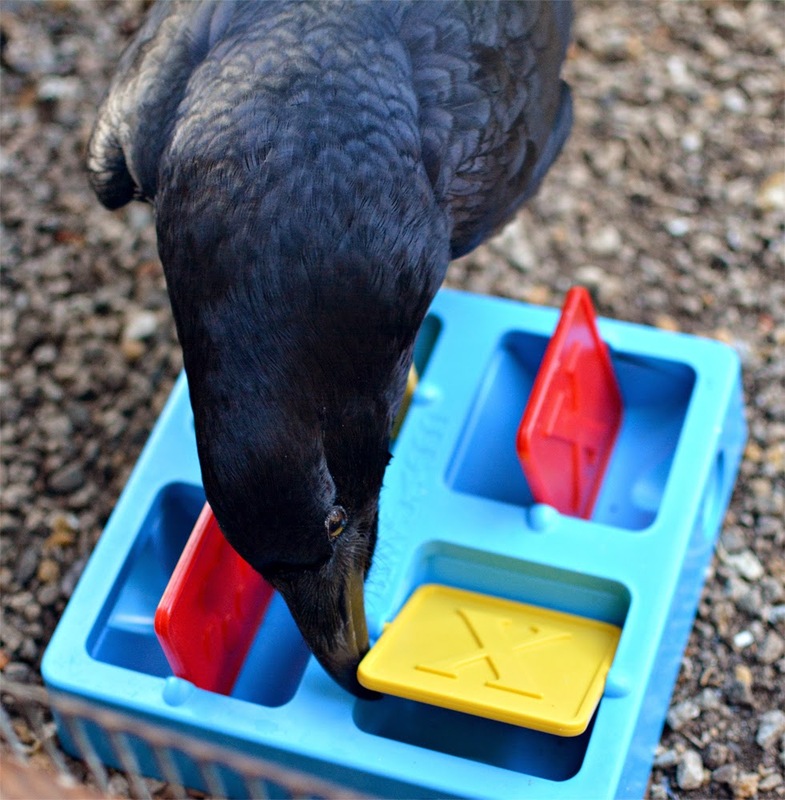 The puzzle includes four removable square blocks that each hide a food compartment. 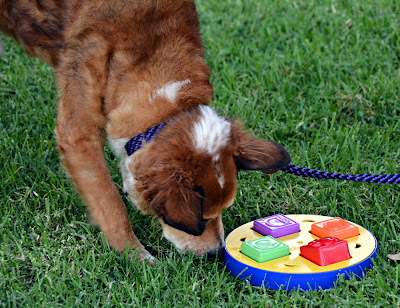 Once all blocks have been removed, the yellow disc on top spins freely to reveal four more small treat compartments. Solving this puzzle takes a similar set of skills as solving the Yin-Yang-Yum, though I think this one may be easier. 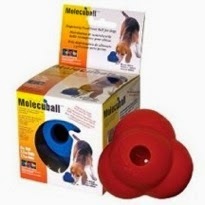 For starters, the colored cups sit a little looser in their holes, making it easier for the dog to wiggle them around and realize they can be picked up. The top disc on this one also spins very easily once the cups are removed, and the thin yellow disc seems to be more intuitive than the thicker lids of the Star Spinner or Yin-Yang. Both Brisbane and Ulysses figured out right away that spinning the disc would uncover the treats. Ulysses still hasn't quite figured out how to pick up the blocks to uncover the food, but I think he might be getting closer with the Doggy Blocks Spinner. The square blocks seem easier to pick up than round cups. I usually pick up the blocks to show him the treats first, and sometimes I even put the blocks on the floor by themselves with treats underneath to help him with the concept. 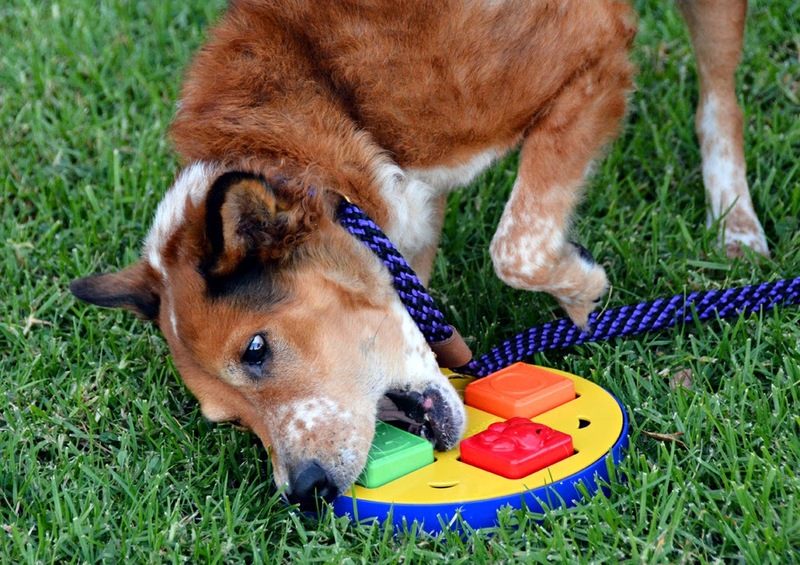 He has seen this toy once now, and the Yin-Yang several times and he might be starting to catch on. 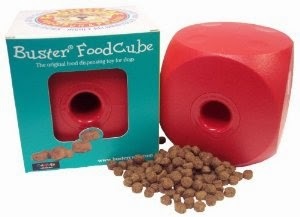 It holds a bit more than half a cup of kibble, far more than my monsters usually eat at once. 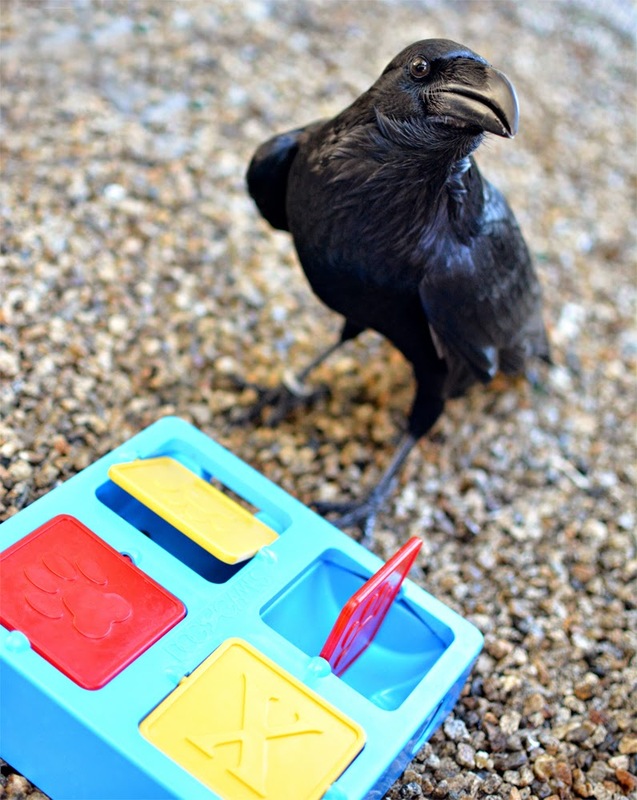 Pick up blocks, spin disc, dump in food, reassemble. There's a lot of parts, but zero effort. Ulysses might starve if this was his only dinner option. 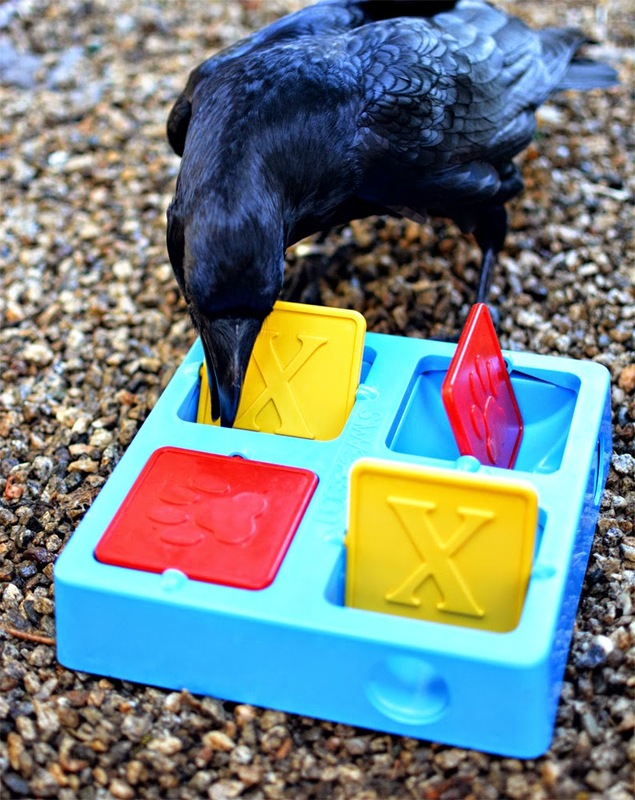 It takes him 10-20 minutes to solve this puzzle depending on how much I help. 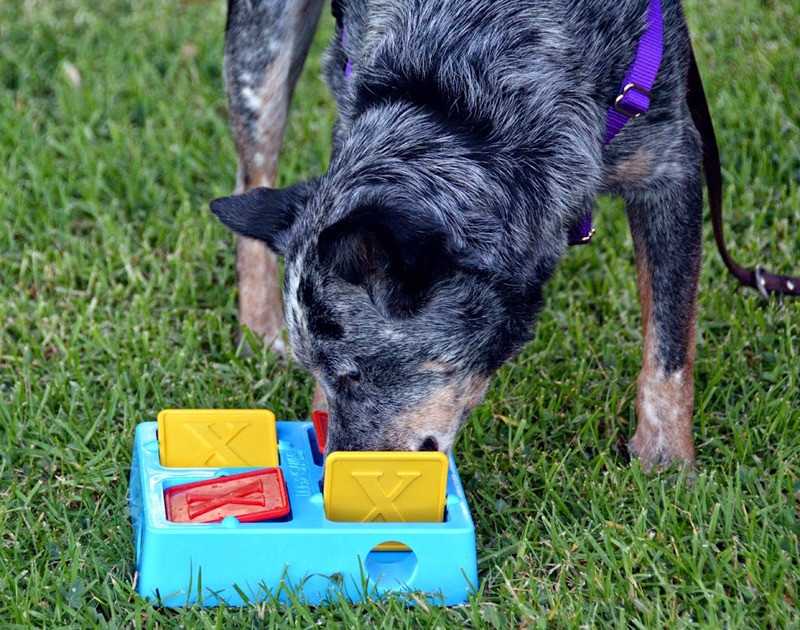 Brisbane solves the Doggy Blocks by methodically moving each block, with no hesitation. 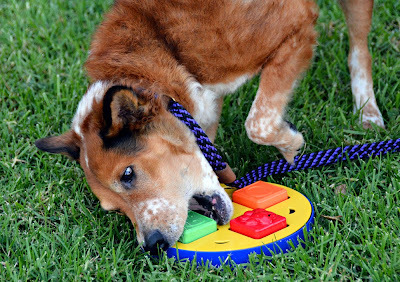 Still, it takes him a good five minutes or more to completely open the thing. I could put just one treat in there, in one of the compartments under the disc, and it would still take him almost as long. 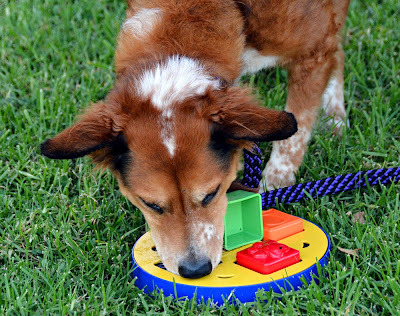 A huge dog might have trouble getting the blocks into his mouth. A tiny one may also have the same issue, though I'm pretty sure Ru could dig the blocks out of here if he really wanted to. The hard plastic won't stand up to chewing, and the yellow disc is pretty flimsy. Both Brisbane and Uly first tried to move it by bending it away from the blue base instead of spinning. 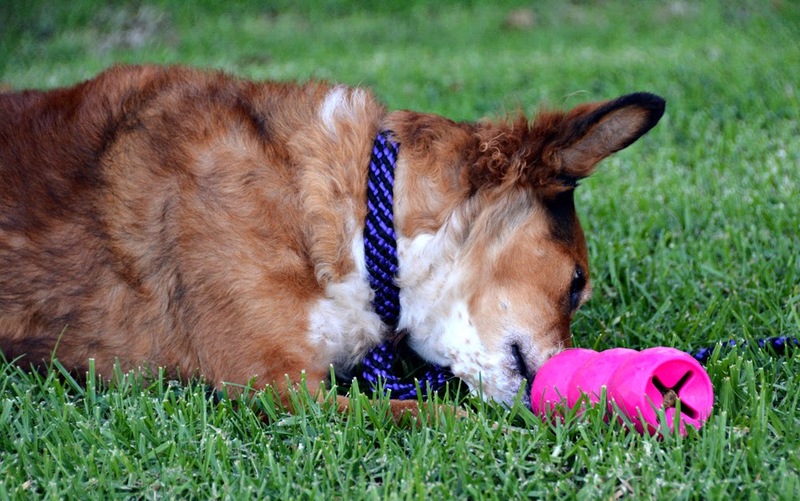 That said, this is a supervision only toy anyway, so nobody is suggesting a dog be left unattended with it. This is an interactive toy that we use with me sitting on the floor cheerleading. Put it on a rug and it's pretty darned quiet. Rubber feet on the bottom keep it from sliding too much. 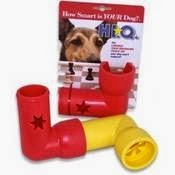 It does have the potential to make a racket though, given how much the dogs want to violently shove it backwards across the room with their front feet. 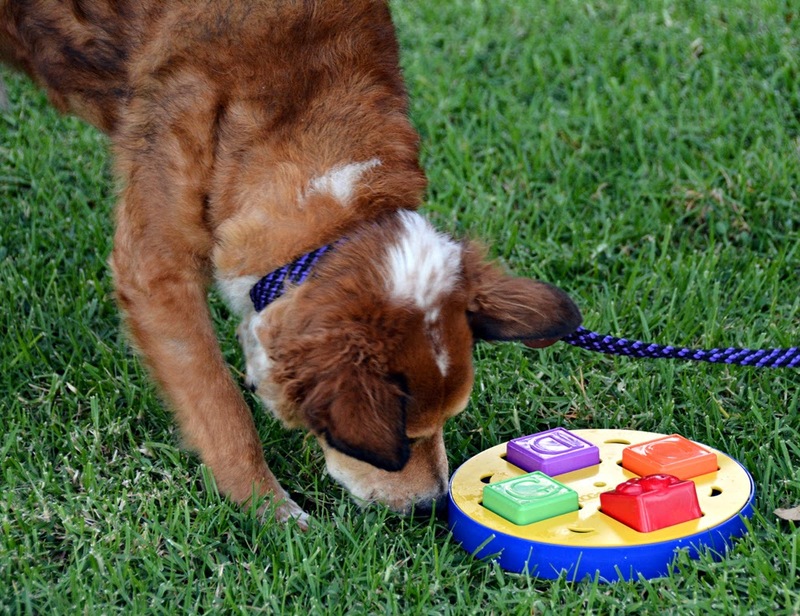 While this is a supervision-only toy, it also has four, count them, four removable pieces. We generally get this out and play with it and then stick it back in the toybox but...it's really only a matter of time until one of those boxes wanders off. (Does anybody else have a Monopoly game in their closet that's missing the shoe? It's like that.) This is an even greater certainty in households with dogs that enjoy hiding things. Dishwasher safe, blah blah. Also not terribly annoying to hand scrub and dry, this is where those removable blocks are kind of helpful. 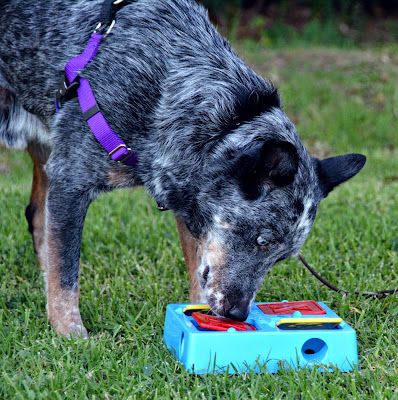 This is a supervision-only toy so there will be no hoarding. 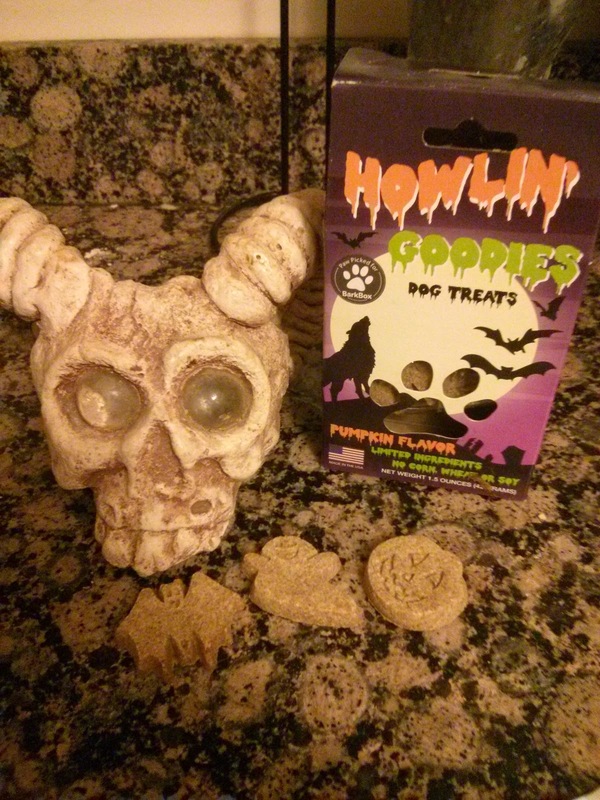 Our little box of Wet Noses Howlin' Goodies arrived in our October Allergy-Friendly BarkBox. The super-cute little cookies were shaped like pumpkins, ghosts, and bats. 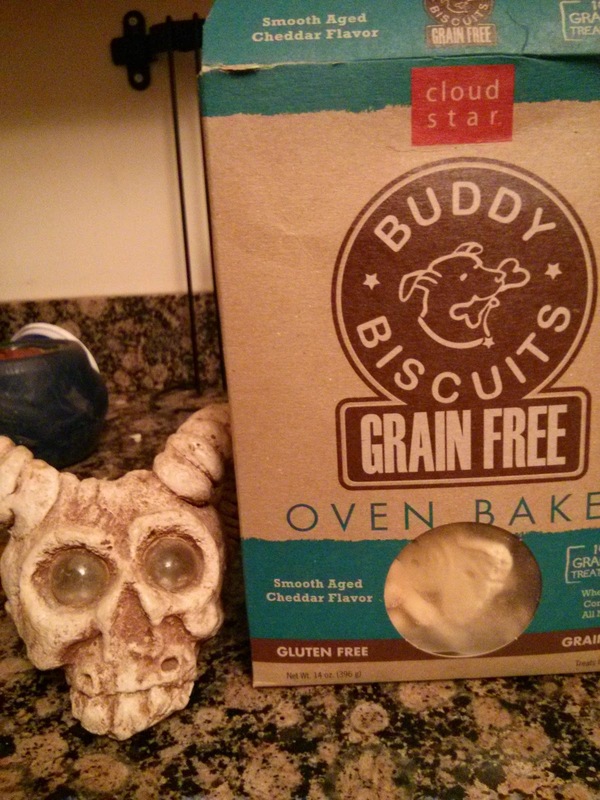 Halloween is my favorite time of year, and themed dog treats were a neat little detail. 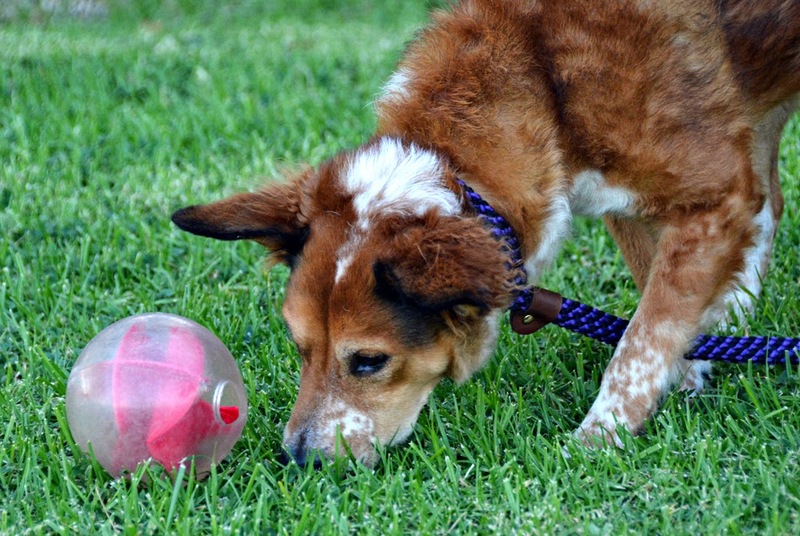 Good For: Sticking inside Kongs. Smearing with peanut butter and hiding inside puzzle like the Yin-Yang-Yum for extra motivation. Not Good For: Breaking into smaller pieces. These things are seriously dense. How Much We Like Them: They were gone within a day of opening the box. 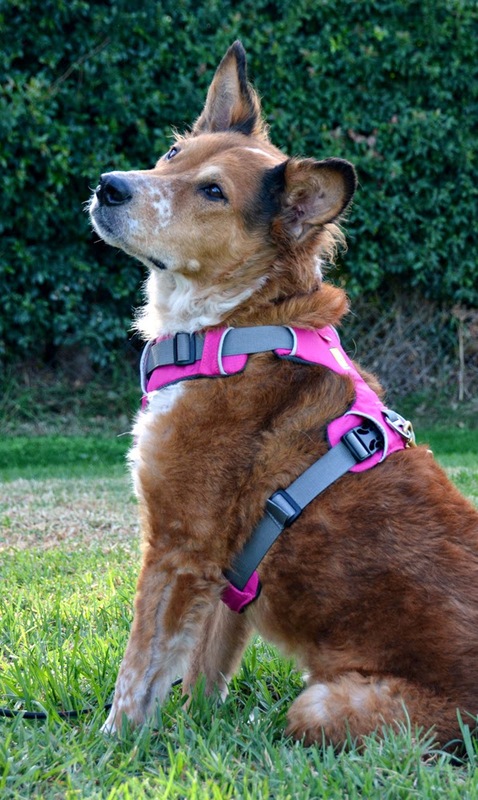 The Freedom No-Pull Harness, by 2 Hounds Design (formerly Wiggles, Wags and Whiskers) is a unique piece of equipment that doesn't really fit into any of the categories by which I usually classify dog harnesses. 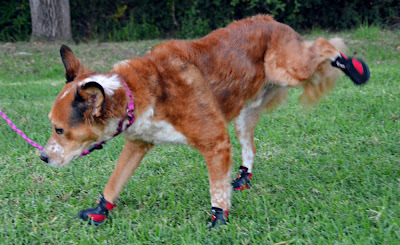 It's shaped more like a step-in than anything else, but goes on like a Roman harness, with the neck loop around the neck, center strap passed between the front legs, and the belly strap clipped around the dog's middle. 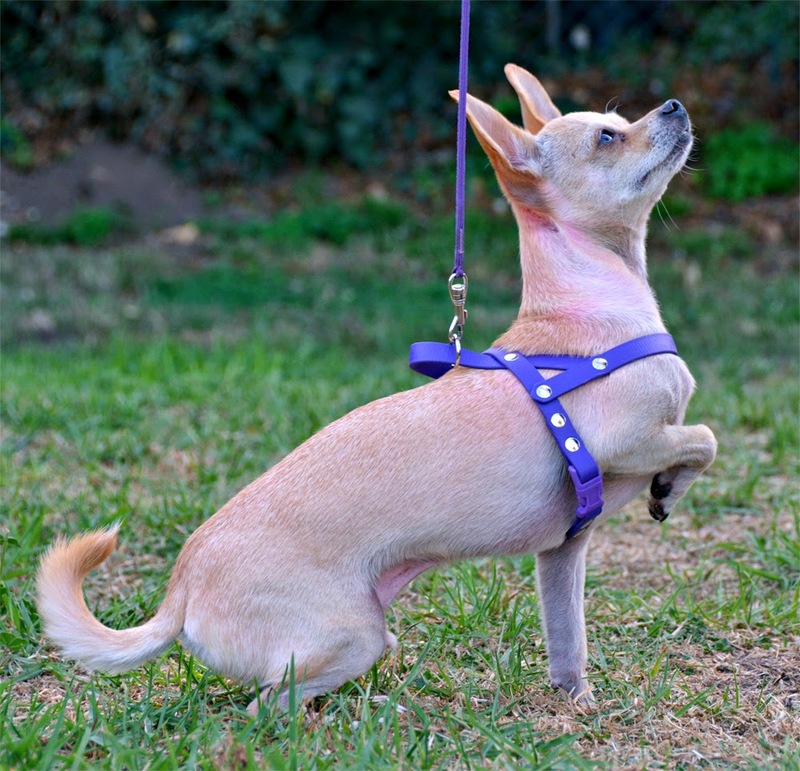 The Freedom Harness comes in twenty different color combinations and two strap widths to fit dogs with chests 14-44" around. 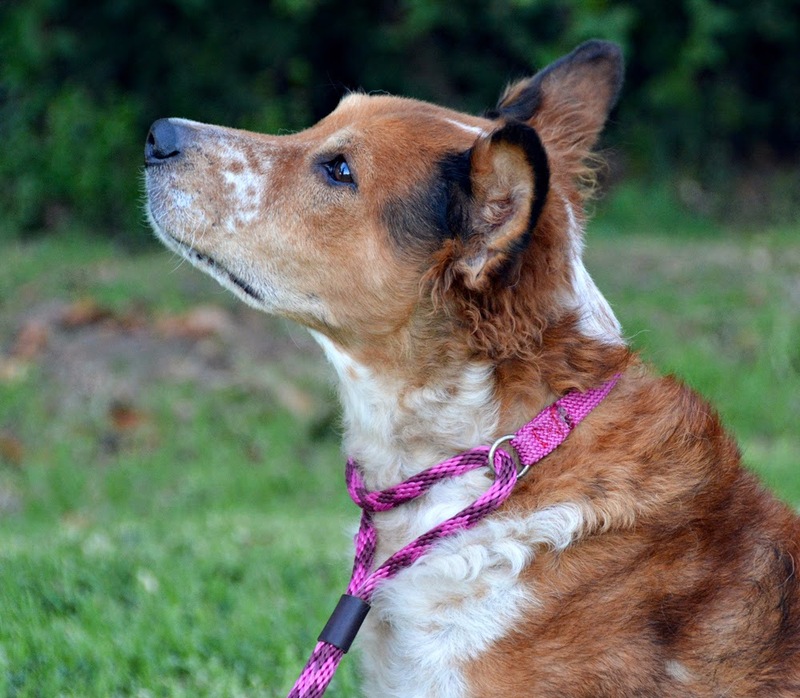 This harness has a martingale loop on the top that serves to tighten the chest strap around the dog's girth. The tightening strap discourages pulling without choking or hitting sensitive pressure points. While most no-pull products use some sort of pain or discomfort to discourage pulling, this one does not appear to bother extra-sensitive Brisbane. One of the things I like best about the Freedom harness is the velvet lining on the straps under the armpits. This makes it very popular for off-track greyhounds and other dogs with sensitive skin. Brisbane's armpits are pretty much naked, so I am very careful with harnesses that have straps anywhere near that area. 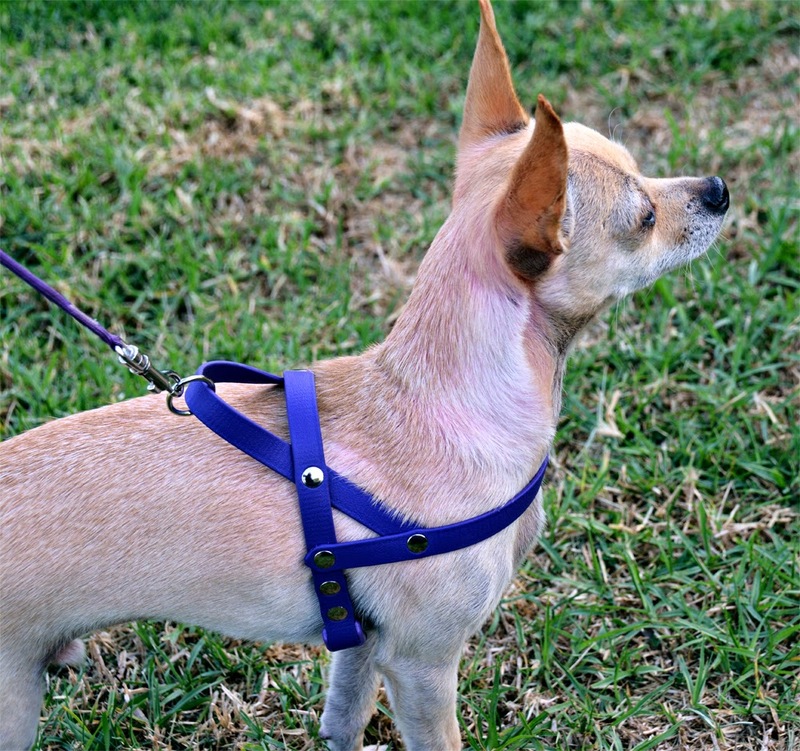 I'm pretty sure the original Wiggles Wags and Whiskers harness was designed specifically for greyhounds. 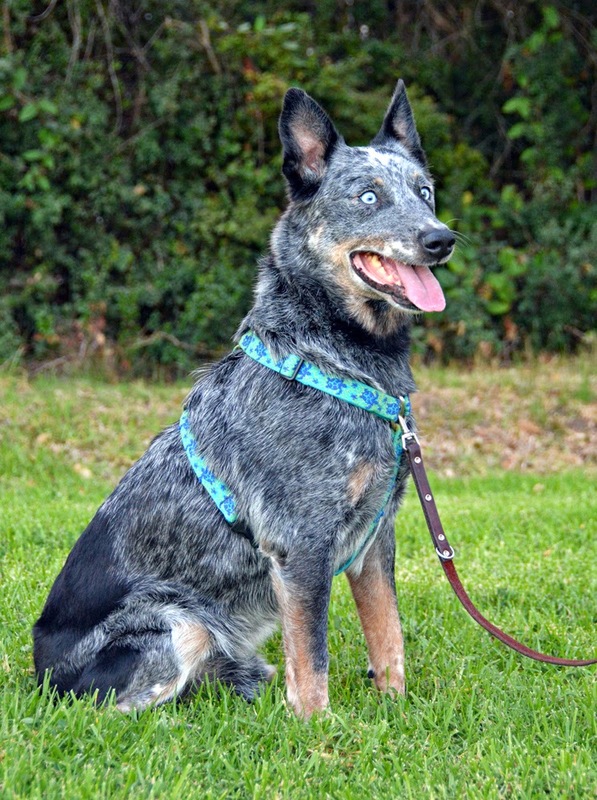 Another unique feature of the Freedom harness is a front leash ring. 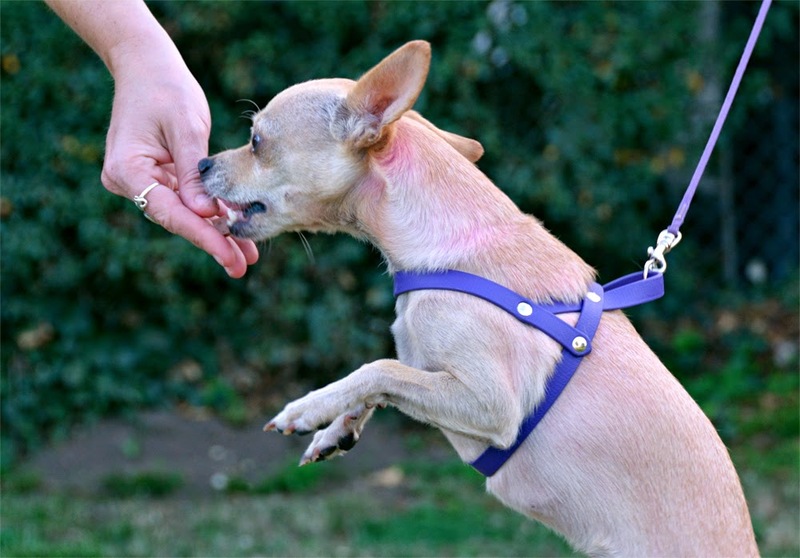 This attachment point does not tighten the harness when leash pressure is applied, unlike the ever-popular EasyWalk harness. 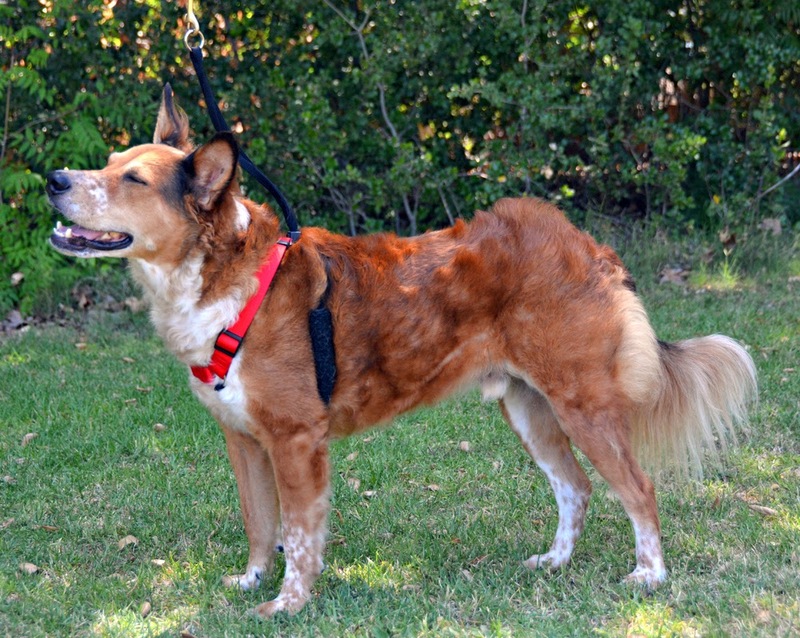 Ideally, the leash should be clipped either to the back ring only, or to both the front and back rings at the same time. 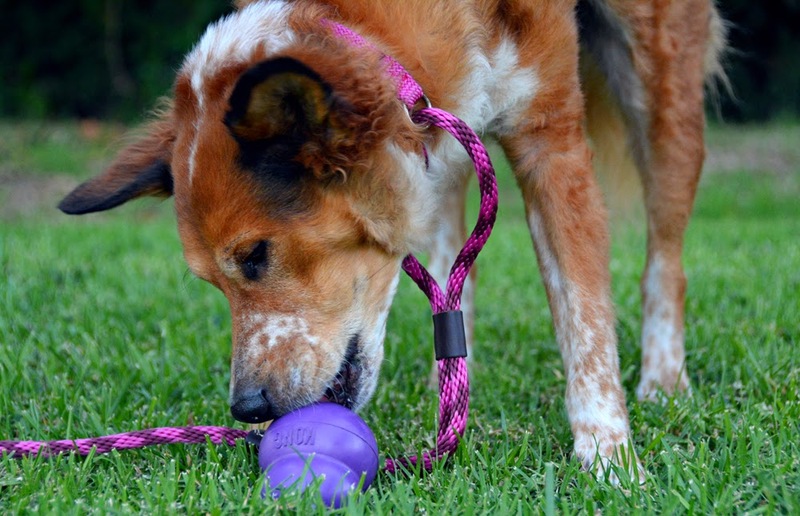 This can be accomplished with a double-ended leash, a regular leash with a carabiner snapped to the handle, or or even two leashes. 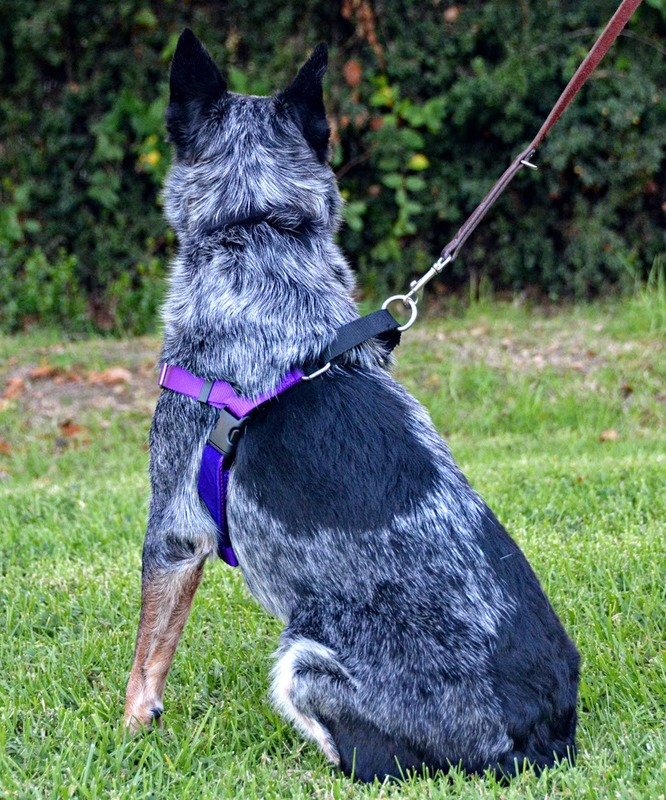 This allows the handler to primarily use the back attachment point to discourage pulling, and the front ring just for turning the dog around. 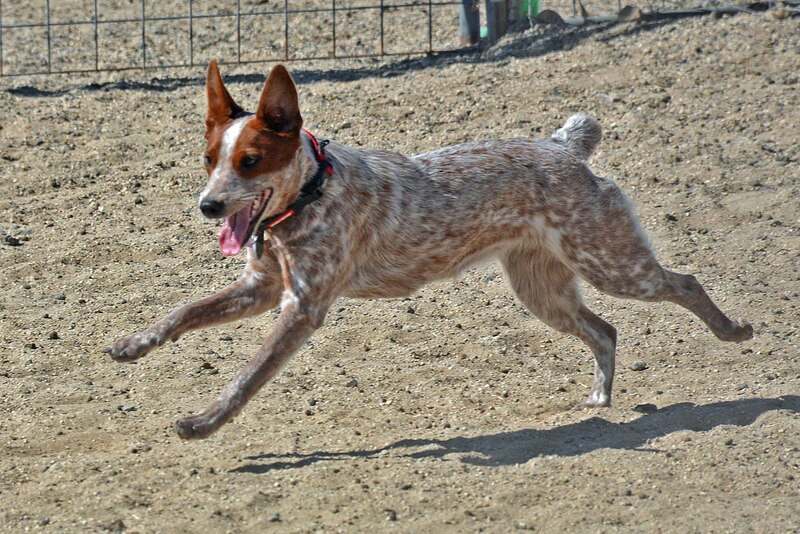 The Freedom harness has been awesome for Ulysses. 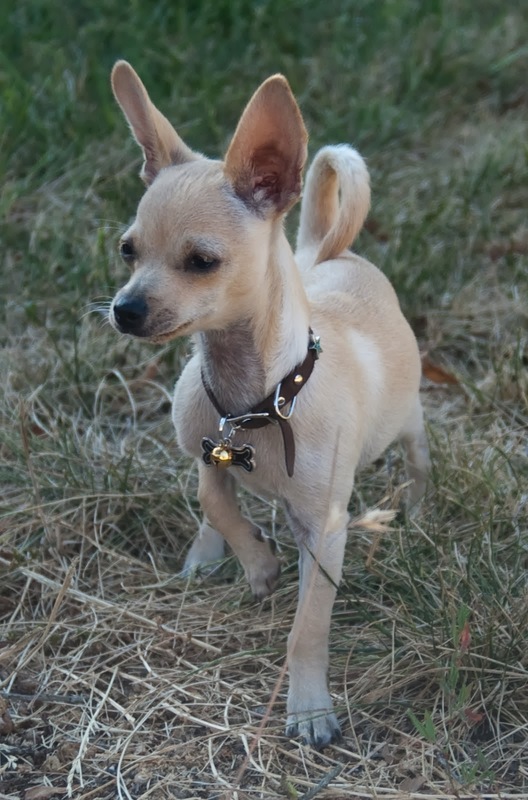 He doesn't really pull on the leash, but he does fixate on things like other dogs in the distance. The front ring allows me to turn him around and walk him away in a manner that does not trigger him to react. 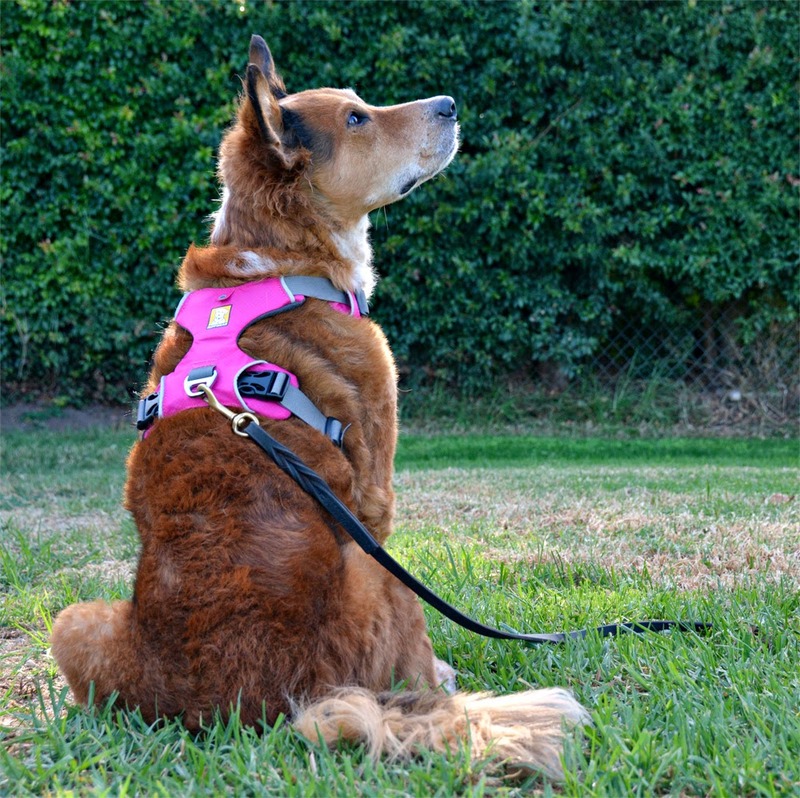 This is the harness that I recommend now for people who have issues with pulling or reactivity. Pros: No-pull feature does not make my uber-sensitive Brisbane act uncomfortable, meaning it is not a hugely negative pulling deterrent like a prong collar or string harness. 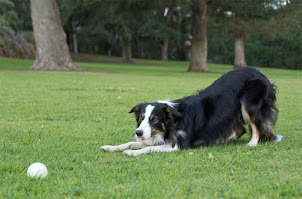 Really does deter pulling, though I have not tried it on a strong dog yet. 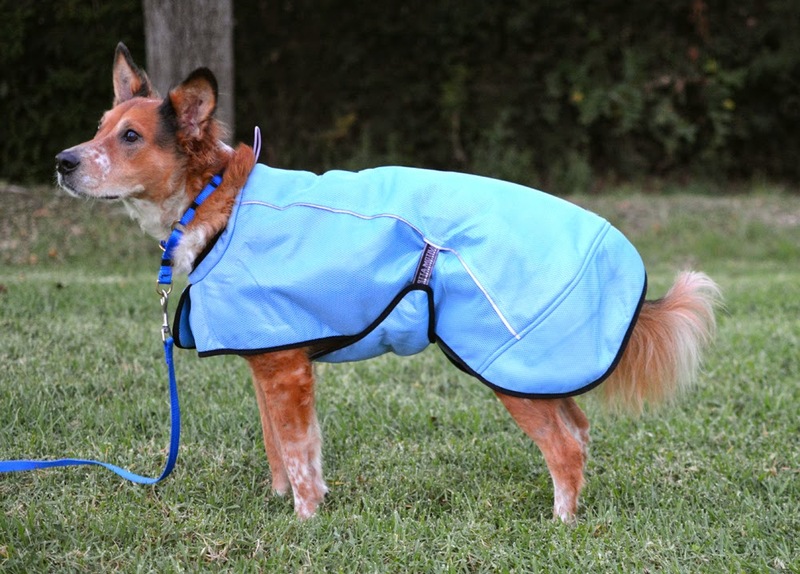 Does not require picking up the dog's feet to put it on, and the neck loop is big enough to go on without touching sensitive ears. Does not hang loosely, can be worn without a leash attached. 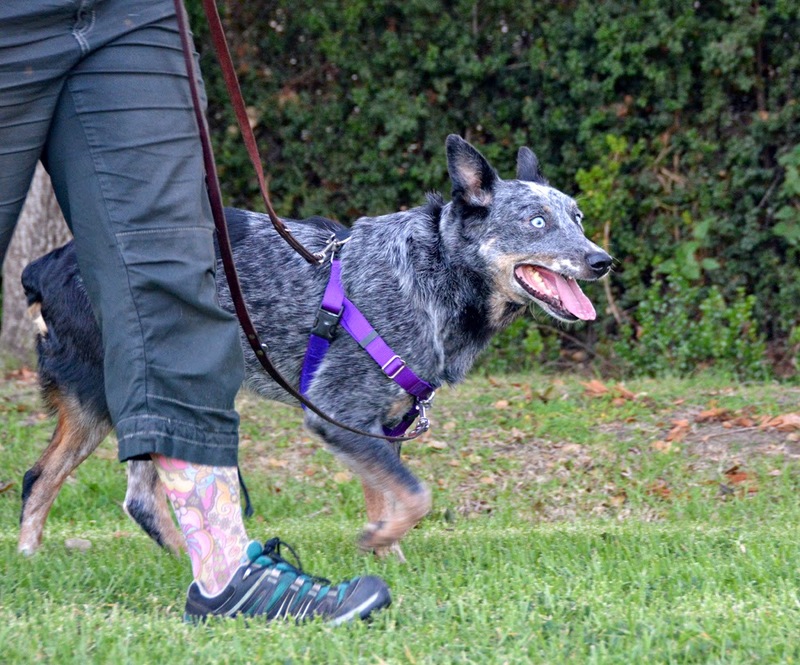 Soft velvet on straps behind the legs help prevent chafing, and the harness does not sit too close to the elbows. Cons: The front strap sits pretty low, probably low enough to interfere with shoulder movement. 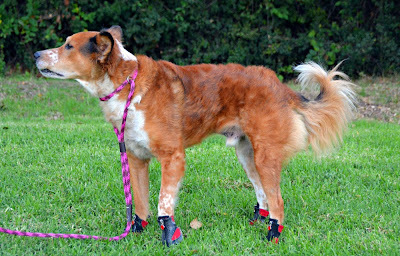 Brisbane recently developed some hip arthritis, and suddenly became visibly unhappy when wearing any harness that touches his shoulders. Our harness is a size large, I tried going down to a medium in hopes of having the strap sit higher, but the back loop section is actually the same length on both sizes. I'm also not in love with the sizing, with the large harness we have almost every strap adjusted as short as possible, with the medium they were all as long as possible. I wish there was more overlap. 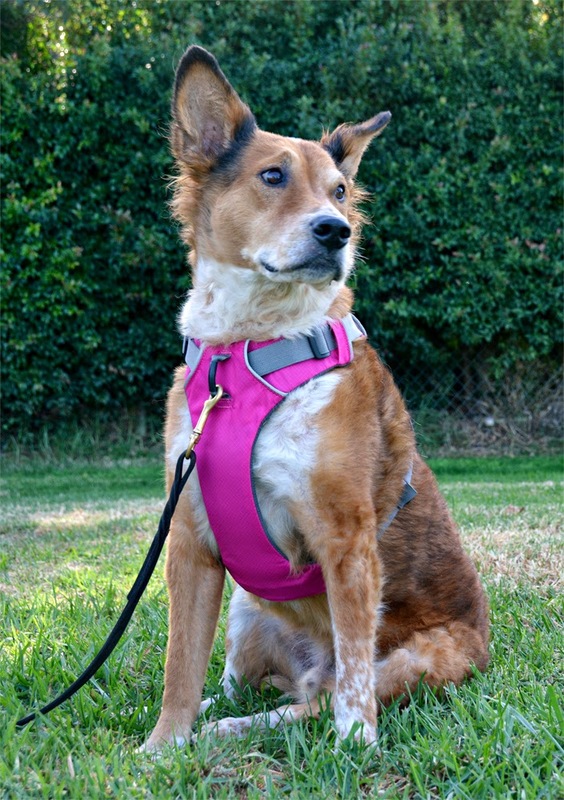 This harness is also sort of complicated for the uninitiated to put on the dog, though it gets easier with practice. Bottom Line: This is my new favorite band-aid for pulling, and for managing reactive dogs. It has been wonderful for Ulysses and I plan to use it for future fosters as well.